The Lachman test is a passive accessory movement test of the knee performed to identify the integrity of the anterior cruciate ligament (ACL). The test is designed to assess single and sagittal plane instability. Lie the patient supine on the bed. Place the patient's knee in about 20-30 degrees flexion. 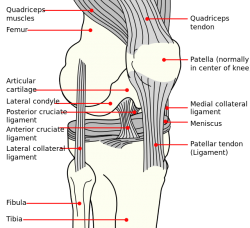 According to Bates' Guide to Physical Examination, the leg should also be externally rotated slightly. The examiner should place one hand behind the tibia and the other on the patient's thigh. It is important that the examiner's thumb be on the tibial tuberosity. On pulling the tibia anteriorly, an intact ACL should prevent forward translational movement of the tibia on the femur ("firm end-feel"). Anterior translation of the tibia associated with a soft or a mushy end-feel indicates a positive test. More than about 2mm of anterior translation compared to the uninvolved knee suggests a torn ACL ("soft end-feel"), as does 10mm of total anterior translation. An instrument called a "KT-1000" can be used to determine the magnitude of movement in millimeters. Katz and Fingeroth  reported that the Lachman test has a diagnostic accuracy of acute ACL ruptures (within 2 weeks of examination) of 77.7% sensitivity and >95% specificity. This study reported the diagnostic accuracy of subacute/chronic ACL ruptures (more than 2 weeks before examination) as having an 84.6% sensitivity and >95% specificity. It is important to note that in this study all examinations were performed under anesthesia, and therefore the diagnostic accuracy in physiotherapy clinical practice may be less. Other special tests with the purpose of diagnosing ruptures of the ACL by testing its integrity include: the knee anterior drawer test and the pivot shift test.